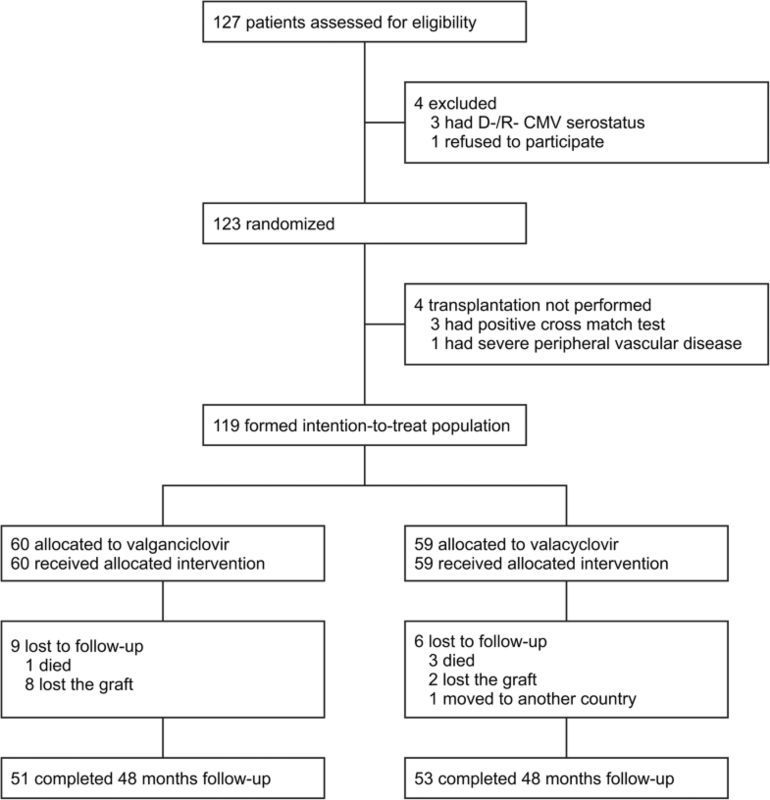 Cytomegalovirus (CMV) prophylaxis may prevent CMV indirect effects in renal transplant recipients. This study aimed to compare the efficacy of valganciclovir and valacyclovir prophylaxis for CMV after renal transplantation with the focus on chronic histologic damage within the graft. From November 2007 through April 2012, adult renal transplant recipients were randomized, in an open-label, single-center study, at a 1:1 ratio to 3-month prophylaxis with valganciclovir (n = 60) or valacyclovir (n = 59). The primary endpoint was moderate-to-severe interstitial fibrosis and tubular atrophy assessed by protocol biopsy at 3 years evaluated by a single pathologist blinded to the study group. The analysis was conducted in an intention-to-treat population. Among the 101 patients who had a protocol biopsy specimen available, the risk of moderate-to-severe interstitial fibrosis and tubular atrophy was significantly lower in those treated with valganciclovir (22% versus 34%; adjusted odds ratio, 0.31; 95% confidence interval, 0.11–0.90; P = 0.032 by multivariate logistic regression). The incidence of CMV disease (9% versus 2%; P = 0.115) and CMV DNAemia (36% versus 42%; P = 0.361) were not different at 3 years. Valganciclovir prophylaxis, as compared with valacyclovir, was associated with a reduced risk of moderate-to-severe interstitial fibrosis and tubular atrophy in patients after renal transplantation. Management of infectious diseases is a critical component of care of solid organ transplant recipients. Both cytomegalovirus (CMV) disease and asymptomatic CMV replication results in increased mortality and graft loss rates [1–5]. These impacts are driven mainly by the cellular and immunological effects of CMV including alloimmune response upregulation by innate immune mechanisms and/or cross-reactivity of CMV-specific T cells with donor MHC-peptide complexes [1, 6–9]. In addition to enhanced graft rejection rates, CMV has been shown to increase the risk of cardiovascular events and other opportunistic infections and is likely to play a role in the development of diabetes and cancer after transplantation [10–13]. Renal allograft fibrosis is the ultimate non-specific histological picture of various allograft injuries [14, 15]. Moderate-to-severe interstitial fibrosis and tubular atrophy (IFTA) is strong predictor of deteriorated graft survival . The underlying mechanism in the development and progression of fibrosis is activation of the inflammatory cascade with subsequent formation of profibrotic mediators such as TGF-β . Together with donor characteristics, there are a host of post-transplant contributors to IFTA development including inflammation associated with viral infections [14, 15]. Multiple studies have documented upregulation of profibrotic and vasculopathic growth factors in CMV infection, with some studies also reporting a higher incidence of IFTA in patients after previous CMV replication [6, 17–19]. CMV prevention taking the form of prophylaxis or preemptive therapy is recommended . Either strategy results in a reduced incidence of CMV disease and infection, with lower mortality and acute rejection rates as an additional plus with prophylaxis [20–23]. 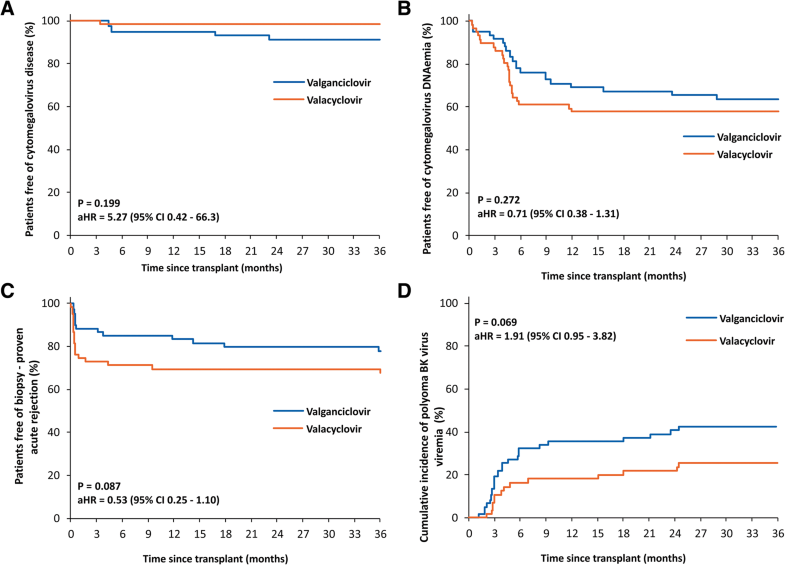 As an alternative to valganciclovir prophylaxis in renal transplant recipients, valacyclovir has also been well documented to be effective [20, 22–24]. Still, in a long-term comparison with valganciclovir-based pre-emptive therapy, valacyclovir prophylaxis was associated with a higher incidence of severe IFTA and inferior graft survival . To establish potential differences between valganciclovir and valacyclovir prophylaxis, we performed a randomized trial (2VAL Study) showing a decrease in the rates of acute rejection with valganciclovir . This article presents the long-term results of the 2VAL Study focused primarily on the incidence of IFTA in late protocol biopsies. Details of the study design were published previously . In brief, adult renal transplant recipients from a single center were recruited from November 2007 through April 2012. The major exclusion criterion was recipient (R) and donor (D) negative CMV serology (D−/R-). Patients were randomized by the transplant physician using a random-number table, at a 1:1 ratio, to valganciclovir (900 mg daily) or valacyclovir (2 g four times daily) prophylaxis for 3 months. Sequentially numbered sealed envelopes were used for allocation concealment. Polymerase chain reaction (PCR) for CMV DNA from whole blood was performed at predefined time points during the first 12 months . After 12 months, PCR was performed only if clinically required. The protocol of immunosuppression was described previously . Recipients of grafts from highly marginal donors were treated with basiliximab and low-dose tacrolimus. Polyoma BK virus (BKV) DNAemia was tested every month for the first 6 months, 3 months until 24 months, at 36 months, and if clinically indicated. The primary endpoint was the incidence of moderate-to-severe IFTA assessed on protocol biopsy at 36 months. Secondary endpoints included intrarenal mRNA expression of profibrotic genes, chronic rejection, CMV DNAemia, CMV disease, biopsy-proven acute rejection, renal function, patient and graft survival (not censored for death), and other infections. In addition, other potential indirect effects of CMV such as cardiovascular events or new-onset diabetes mellitus, malignancy, and routine laboratory parameters were recorded prospectively. All patients remained on follow-up for a minimum of 4 years after transplantation or until death. Patient and graft survival was assessed at 4 years, with other variables at the end of 3 years. In patients with functioning grafts, protocol biopsy was performed at 36 months using an 18-gauge needle (biopsy gun). A minimum of two cores were obtained. Tissues for light microscopy were fixed in 4% formaldehyde, embedded in paraffin using routine procedure, and processed as described previously . All biopsies were evaluated according to the Banff classification by a single pathologist blinded to the study group of the patients . Intrarenal mRNA expression analysis was performed as described previously (Additional file 1: Table S1) [4, 25]. We anticipated a 40% incidence of moderate-to-severe IFTA in late protocol biopsy . Based on the association between acute rejection and IFTA [14, 15] and reduction in acute rejection with valacyclovir [23, 24], we assumed a 50% reduction in the relative risk for moderate-to-severe IFTA in the valacyclovir group. It was necessary to enroll at least 82 patients to ensure an 80% power to detect a treatment difference with a type 1 error of 0.05. A minimum of 114 patients was required for the 12-month primary endpoint (acute rejection) assessment . This number was considered sufficient even with the anticipation of patients lost to late protocol biopsy. Quantitative parametric data were compared using Student’s t-test and the Mann-Whitney U-test in non-parametric distribution. Qualitative data were analyzed using the chi-square or Fisher exact test. The risk of moderate-to-severe IFTA in the valganciclovir group compared to valacyclovir was calculated by logistic regression. Because of an imbalance in high-risk donor distribution and related immunosuppression, the odds ratio (OR), and 95% confidence interval (CI) adjusted for calcineurin inhibitor, induction therapy, and advanced chronic histologic damage (moderate-to-severe nephrosclerosis, diabetic nephropathy and/or ≥ 15% of glomerulosclerosis) in donor procurement biopsy were calculated by multivariate logistic regression. The incidence of time dependent variables was calculated using Kaplan-Meier curves, with the log-rank test and the Cox proportional hazard model adjusting for the above variables. Data were analyzed according to the intention-to-treat principle. Statistical calculations were made using SAS software (SAS Institute Inc., Cary, NC). Values of P < 0.05 were considered statistically significant. Overall, 119 patients were enrolled (Fig. 1), of which number 60 were randomized to valganciclovir prophylaxis and 59 to valacyclovir. The almost double the number of patients treated with basiliximab induction and low-dose tacrolimus protocol, indicated only in high-risk donors, and a detailed analysis of donor procurement biopsies revealed a lower quality of donors in the valganciclovir group (Table 1, Additional file 1: Table S2). The groups did not differ in maintenance immunosuppressive therapy including drug levels and doses in the ensuing years (Additional file 1: Table S3). Protocol biopsy at 36 months with sufficient material was performed in 51 and 50 patients in the valganciclovir and valacyclovir groups, respectively. The main causes for not performing biopsy were death or graft loss. Moderate-to-severe IFTA was less frequent in the valganciclovir group (11 of 51 [22%] versus 17 of 50 [34%]; OR, 0.53; 95% CI, 0.22–1.30; P = 0.166 by logistic regression) (Table 2). After adjustment for baseline characteristics, which reflected the higher proportion of high-risk donors in the valganciclovir group, the risk for developing moderate-to-severe IFTA was significantly lower in valganciclovir-treated patients (aOR, 0.31; 95% CI, 0.11–0.90; P = 0.032 by multivariate logistic regression). Advanced chronic histologic damage in donor procurement biopsy was significantly associated with moderate-to-severe IFTA (aOR, 7.05; 95% CI, 2.28–21.8; P < 0.001). While patients experiencing acute rejection showed a trend toward an increase in moderate-to-severe IFTA (41% versus 23%; aOR, 2.89; 95% CI, 0.88–9.73; P = 0.087), the effect of polyoma BKV viremia was negligible (29% versus 27%; aOR, 0.60; 95% CI, 0.18–2.07; P = 0.422). Patients with moderate-to-severe IFTA showed increased intrarenal mRNA expression of a wide range of profibrotic genes (Additional file 1: Table S4). However, univariate unadjusted analysis did not document any significant differences between the valganciclovir and valacyclovir groups (data not shown). After 12 months, CMV disease was diagnosed in 2 valganciclovir group patients. One case involved CMV syndrome in a D+/R- patient, the other CMV colitis after thymoglobulin administration for acute rejection despite a new course of valganciclovir prophylaxis. The difference was not statistically significant at 36 months (Fig. 2a). After 12 months, CMV DNAemia was present in 5 patients in the valganciclovir group with 3 cases involved a new-onset episode and 2 a recurrent one in contrast to 1 recurrent episode in the valacyclovir group. CMV DNAemia with viral load of ≥1000 copies/mL comprised 3 out of 5 episodes in the valganciclovir group and a single episode in the valacyclovir group. At 36 months, the cumulative incidence of CMV DNAemia was comparable in both groups (Fig. 2b and Table 3). After 12 months, late acute rejection was detected in 4 and 1 patients in the valganciclovir and valacyclovir groups, respectively. In the valganciclovir group, the event was preceded, in all 4 patients, by their demonstrable noncompliance or immunosuppression reduction due to infectious complications (Fig. 2c). While, after 12 months, a new-onset episode of polyoma BKV viremia was documented in 4 patients in both the valganciclovir and valacyclovir groups, the cumulative incidence remained – given the differences within the first 12 months – higher with valganciclovir (42% versus 26%; P = 0.046 by log-rank test) (Fig. 2d). Likewise, although not significantly different, the incidence of polyomavirus-associated nephropathy (PVAN) was higher in the valganciclovir group (12% versus 4%; P = 0.098 by log-rank test). PVAN had an appreciably adverse effect on graft survival (56% versus 91%; P < 0.001 by log-rank test) with 3 graft losses directly related to PVAN in valganciclovir-treated patients. The groups did not differ in the incidence of other viral, bacterial, and fungal infections. At 4 years, patient and graft survival rates were excellent in either group. Regarding the other secondary outcomes, no differences were found between the groups (Table 4). Long-term results of this only randomized study comparing valganciclovir and valacyclovir for CMV prophylaxis in renal transplant recipients published to date demonstrated a lower incidence of moderate-to-severe IFTA at 3 years in patients treated with valganciclovir. This finding was unexpected at study initiation given the promising results of valacyclovir prophylaxis in reducing the risk of rejection in earlier studies [23, 24]. Still, it is fully consistent with the 12-month data of the present study documenting a significant decrease in acute rejection rates with valganciclovir prophylaxis. By contrast, polyoma BKV viremia, whose incidence was increased at 12 months in the valganciclovir group, had no adverse impact on the risk of IFTA . Severe forms of IFTA are associated with a marked increase in the risk of graft failure [14, 16]. The negative effect of IFTA is further enhanced by co-existing graft inflammation or circulating donor-specific anti-HLA antibodies (DSA) [15, 16]. While effective prevention of IFTA from developing is critical for improving transplantation outcomes, it is most difficult because of its multifactorial etiology . Our study has suggested that optimal CMV prevention could be part of a comprehensive strategy to reduce IFTA incidence. The dominant factors leading to the development and progression of IFTA include nonspecific inflammation and, particularly, inflammation secondary to alloimmune activation. Acute rejection, subclinical rejection including antibody-mediated rejection or the presence of DSA have a strong profibrotic potential and result in the development of severe IFTA with overlapping gene expression profile of biopsies with IFTA and immune-mediated inflammation [15, 29–31]. Because of CMV-associated intragraft inflammation, CMV is a potential risk factor for IFTA regardless of whether the underlying mechanism is heterologous immunity or promotion of local inflammation . Cytomegalovirus significantly increases the risk of acute cellular rejection and, in patients with DSA, it may be involved in the pathogenesis of antibody-mediated rejection [8, 10]. In our study, the reduction of IFTA in patients receiving valganciclovir prophylaxis cannot be explained by different efficacy in CMV prevention. The rates of CMV DNAemia were comparable both in the long-term and early period (within 3 months) after transplantation . The most logical cause is the decrease in acute rejection in patients randomized to valganciclovir . Consistent with the above studies, the risk of our patients experiencing acute rejection to develop moderate-to-severe IFTA was almost three times higher. The difference in the incidence of acute rejection occurred in the early post-transplant period. One could speculate that the incidence of subclinical inflammation over the first post-transplant weeks could be also decreased with valganciclovir. While, in our study, the first protocol biopsy was not performed until month 3, recent data suggest a high proportion of inflammation associated mainly with mild IFTA detected by protocol biopsy at 6 weeks . Early subclinical inflammation constitutes a risk factor for IFTA progression . The present study is a second trial documenting inferior outcomes of valacyclovir prophylaxis compared to valganciclovir-based CMV prevention. Compared with preemptive therapy, valacyclovir prophylaxis was associated with a higher incidence of IFTA and profibrotic gene expression . In an animal model, ganciclovir prophylaxis attenuated late renal allograft damage and reduced intragraft immune infiltrates persisting even after prophylaxis discontinuation . A theory explaining the lower rates of acute rejection and subsequent IFTA development with valganciclovir prophylaxis is built on reduced intragraft inflammation through a direct effect of ganciclovir on T-lymphocytes. In studies with healthy volunteers and renal transplant recipients, (val) ganciclovir suppressed T-lymphocyte proliferation and activation by impaired DNA synthesis [33, 34]. Further studies are warranted to confirm the clinical relevance of this theory. The decrease in IFTA over the 4 years of follow-up did not result in better graft survival in the valganciclovir group. Lower quality donors may have influenced graft survival. While it is likely that follow-up may have been still too short in this respect, an alternative explanation may be an increased incidence of polyoma BKV infection. In our study, BKV viremia was not shown to negatively impact the risk of moderate-to-severe IFTA or graft loss, which comes as no surprise since low-viral load BKV viremia was predominantly involved. The risk of graft loss or graft dysfunction is increased with persistent high-viral load BKV viremia or PVAN, where recent data have additionally suggested increased de novo production of DSA [35, 36]. The numerically higher incidence of PVAN in patients treated with valganciclovir prophylaxis requires extra caution. While our study was not powered to detect significant differences in the incidence of PVAN, the rates were clinically not negligible with 3 cases of graft loss directly related to PVAN in the valganciclovir group. Also in a recently published study, full dose valganciclovir prophylaxis resulted in higher rates of PVAN . It is conceivable that valganciclovir had an effect on the BKV-specific cellular immune response making BKV replication more frequent [38, 39]. Several limitations of the study should be mentioned. Despite adequate randomization, there was an imbalance in the proportion of high-risk donors tilted against the valganciclovir group. As expected, tacrolimus-based immunosuppression indicated in at-risk donors and the presence of advanced chronic histologic damage in donor procurement biopsy were strongly associated with moderate-to-severe IFTA. As donor quality is a major risk factor in the development of severe IFTA [14, 16], it was critical to adjust the risk of moderate-to-severe IFTA and other important secondary outcomes for baseline imbalance . Some univariate analyses related to IFTA, and intragraft mRNA gene expression in particular, may have put the valganciclovir group at a disadvantage. Another limitation was the small number of CMV D+/R- patients which does not allow to extrapolate our results to high-risk patients. Generally, the sample size of our study precludes adequate assessment of any potential differences in some secondary outcomes. Compared with valacyclovir, valganciclovir prophylaxis is associated with lower risk of moderate-to-severe IFTA at 3 years after renal transplantation. Further studies are warranted to determine whether the more favorable late histologic findings reported with valganciclovir-based regimens stand out only when compared with high-dose valacyclovir prophylaxis or, possibly, with investigational drugs for CMV prevention such as brincidofovir or letermovir [25, 41, 42]. The authors thank Lenka Karlikova for her assistance in data collection. This work was supported by the National Sustainability Program I [LO1503] provided by the Ministry of Education, Youth and Sports of the Czech Republic, the Charles University Research Fund [Progres Q39], and in part by Institute for Clinical and Experimental Medicine [MZO 00023001]. TR wrote the article, designed the study, collected clinical variables, participated in data analysis and interpretation. MK collected clinical variables, participated in data analysis and interpretation, revised the article. PH participated in study design, performed intrarenal gene expression, revised the article. HH performed PCR for CMV DNA, revised the article. OH evaluated kidney graft biopsies, revised the article. DL performed PCR for CMV DNA, revised the article. SK performed statistical analyses, revised the article. MB collected clinical variables, revised the article. All authors read and approved the final manuscript.